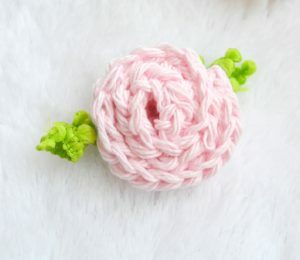 2K Shares After making a bunch of little roses (see the pattern for them HERE), I was trying to figure out what I could use them for (I don’t know why I made so many in the first place!).? Thanks to many of you for the ideas! Of course, as usual, my daughter wanted something with the flowers. 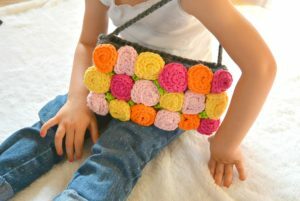 The idea of adding flowers to a bag or purse was suggested, and I decided to go with that.? There is surely a hat with flowers in my daughter’s future as well. __? 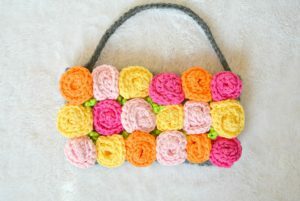 I wanted to cover the entire front of the purse, and almost had enough?roses to do so.? 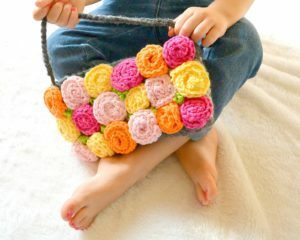 The bag ended up being a bit bigger than I had planned, and I had to?crochet a few extra roses. I really don’t enjoy making the same thing over and over, hence why I’ve never done a granny square blanket. One day, I hope, one day! 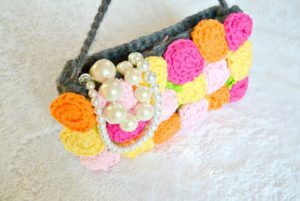 For this purse I used up my scrap, super bulky yarn. I am not sure whether it uses a skein or two as I used two separate skeins that were already partly gone. I used a size H hook, which creates a tight fabric ensuring none of baby’s pretend lip glosses or pennies go slipping out of holes in the purse! That could cause?a melt down, and no sane mother wants such things.Notes:*The opening is simply closed with?two small?ribbons which I tied to?each side?of the purse. *You need only know how to single crochet for the purse portion. *It is made in two pieces and seamed along the bottom and sides. *The handle is simply tied onto both sides of the? purse. *The roses are tied on and knotted one by one, and the excess yarn cut off. *It measures about 5 x 8.5 inches You will need:For the purse portion:Super bulky yarn 1 – 2 skeinsScissorsTapestry needleSize H crochet hookFor the roses:Here is a list but please see my ROSES PATTERN AND SUPPLIES to see how to make these flowers __Worsted weight yarn ( I used Lily Sugar and Cream)Size F crochet hookScissorsTapestry needleOptional greenery Purse Pattern:With your size H hook and super bulky yarn, Chain 24Row 1 In second chain from hook, Single Crochet. 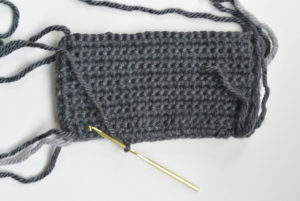 Single Crochet in each stitch across row (total of 23 sc stitches). Chain one and turn.Row 2 until piece measures?approximately 5?inches tall?– Repeat pattern from row 1 (Single crochet across row, chain one, turn)* This pattern will make one rectangle for one side of your purse. Repeat this pattern in order to make a second side. * Face the right sides together. Seam sides and bottom of purse ( I seamed with single crochet, but you can use whatever method you prefer) Turn the purse right side out and push out corners to shape. *If you want to be able to tie it closed, attach a ribbon to both sides of the purse. I attached them to the top interior so that you can’t see them.? This ribbon keeps the purse closed, but it is definitely not sufficient if you are keeping a wallet and important things in the purse! Since it is just for my toddler, this closure works fine.? Maybe you can think of something better if you plan to put more “adult” type items in the bag. __ I don’t really care if my baby’s fruit snacks happen to fall out as she twirls?that purse?around. Here I am seaming my two rectangles together. I still need to tie in all those ends. MY LATEST VIDEOSHandleChain 40 with your super bulky yarn. Attach and tie?the ends of the chain?to either side (long ways)?of the purse. 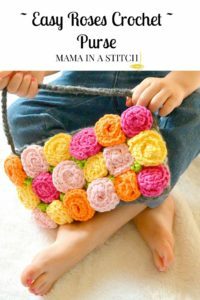 Totally painless!Attaching the roses:Follow the instructions and pattern for the roses by clicking HERE*You do not have to add the greenery – that is definitely optionalOnce you have made?18 roses, attach and tie them to the purse. 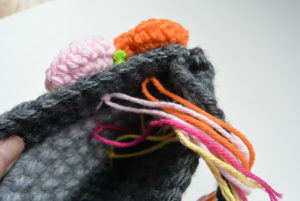 Make sure to thread your yarn toward the outside of the roses and tie them on.? If you tie them on just from the middle of the rose, they tend to flop around?a bit.